A Health Insurance Exchange is a new marketplace that offers health insurance and coverage options to individuals, families, and small employers. An Exchange will offer a choice of insurance plans and provide information to help you understand what plan best fits your needs. After comparison shopping using easy-to-understand plan summaries, you will be able enroll in a health plan and may be eligible for tax credits to help you pay your insurance premium. Under national health reform, states must have an Exchange in place by Jan. 1, 2014. Exchanges can be developed and implemented by the state or by the federal Department of Health and Human Services. Oregon lawmakers have chosen to develop a state-specific Exchange that fits Oregon’s unique needs and insurance market. Is the Exchange an insurance company? No, the Exchange is not an insurance company. The Exchange is a marketplace where individuals, families and small employers can buy private health insurance, access federal tax credits, and qualify for Medicaid-based health coverage. Oregon’s Exchange is a publicly accountable organization, overseen by a nine-member board of directors, appointed by the Governor and confirmed by the Senate. To whom is the Exchange accountable to? The Exchange is accountable to the public and works for the benefit of the people and businesses that obtain health insurance coverage through the Exchange. Exchange board meetings are open to the public and always allow for public participation through a public comment period. The public can also submit comments through the Exchange website at https://orhix.org/public_comment.html. Who can buy health insurance in the Exchange? Individual and families who do not have access to affordable coverage through an employer can buy in the Exchange. Small employers with 50 or fewer employees also can buy insurance through the Exchange. When can I buy health insurance in the Exchange? You can shop for coverage at the Exchange starting in October 2013. Insurance coverage for plans bought in the Exchange will start Jan. 1, 2014. How will I buy insurance through the Exchange? Consumers will be able to compare health insurance plans and buy insurance in a variety of ways through the Exchange. You may use our website, call our hotline or work with the help of a specially trained navigator or insurance agent. Are there special standards for insurers selling health plans within the Exchange? Yes. The Exchange board will establish standards for participating insurers and the plans they sell in the Exchange. This will give people and small employers who buy insurance through the Exchange a choice of high-quality health plans. Will the Exchange help me pay my insurance premium? In some cases, yes. Tax credits will be available for individuals and families buying in the Exchange with incomes up to 400% of the federal poverty level ($89,400 for a family of four). Based on income, some will also get additional help with cost-sharing expenses, such as co-pays and deductibles. Will small employers receive tax credits? In some cases, yes. Small employers that employ low- and moderate-income workers may be eligible for tax credits to help cover the cost of employee coverage. The credit, which is available today, is designed to encourage small employers to offer health insurance coverage for the first time or maintain coverage they already have. You can learn more at the IRS website. What is Oregon doing to develop its Exchange? During the 2011 Oregon Legislative Session, Oregon lawmakers passed Senate Bill 99, establishing the Oregon Health Insurance Exchange Corporation. In February 2012, the Exchange will present a business plan to lawmakers for review and approval. Click here to read the business plan. Over the next 18 months, the Exchange will focus on developing its technology system, working with stakeholders on designing Exchange operations, and providing education and outreach around the state. How is the Exchange funded? Through the end of 2014, the Oregon Health Insurance Exchange is funded by federal grant dollars. Beginning Jan. 1, 2015, the Exchange must be self-sustaining. To cover its costs, the Exchange will collect an administrative fee from insurance carriers that sell health plans in the Exchange. What happens if the Supreme Court overturns the Affordable Care Act’s requirement that all Americans have health insurance? Oregon has been on a path toward a health exchange for many years, long before the Affordable Care Act. The Exchange will offer valuable services to Oregonians, such as a central place for consumers to compare health insurance plans and a way for small employers to offer more choice for their employees with less administrative burden. These services still will be needed, and the corporation’s goal is to build an Exchange where consumers will want to purchase insurance, with or without a mandate. If the mandate is overturned, the Exchange Corporation will consult with legislators and the Governor to determine whether it needs to make any changes to its business plan. What happens if federal funding for subsidies and tax credits are reduced? The subsidies and tax credits made available as part of the Affordable Care Act will help drive enrollment to the Exchange. If this federal assistance is lowered or eliminated, the Exchange Corporation may have to adjust its enrollment projections. If the Exchange loses its federal funding, is the state of Oregon at any financial risk? No. The Exchange is a public corporation independent of state government and has not received any state funding. If the federal start-up funding is reduced or eliminated, the state is under no obligation to move forward with the Exchange. If this occurs, the Exchange Corporation will consult with legislators and the Governor on next steps. What are the consequences of Oregon not receiving federal readiness certification in January 2013? The Oregon Health Insurance Exchange undergoes periodic reviews by its federal partners to ensure it is on track to receive readiness certification in January 2013. If the federal government determines in January 2013 that any states are not ready to operate an Exchange, it may grant provisional certification. In that case, the state could address the federal government’s concerns and receive certification later. If the federal government finds that a state will not be ready to operate an Exchange, it will move forward on implementing a federal Exchange for that state. 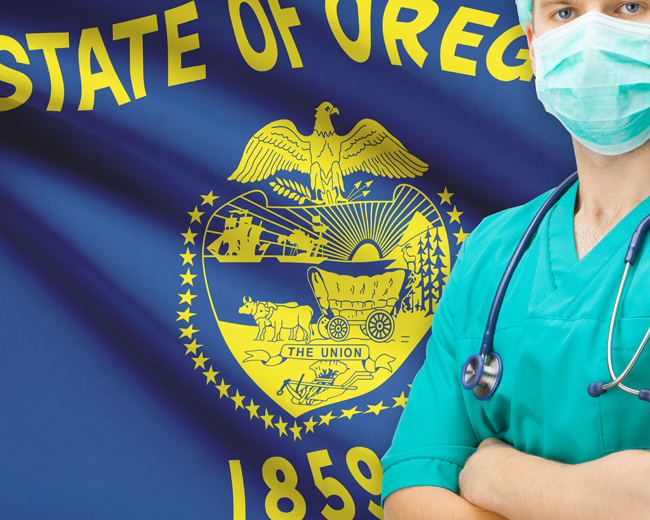 How is Oregon moving forward with its Exchange without federal requirements? There are a number of critical areas where the federal government has not yet released regulations, such as standards for qualified health plans, the functions of navigators and agents, and eligibility determinations, appeals, and exemptions. The Exchange Corporation is watching the federal rules process closely and coordinating statewide responses to requests for comments. The Exchange is developing its web portal using a three-week, iterative process so it can adapt quickly to evolving requirements.